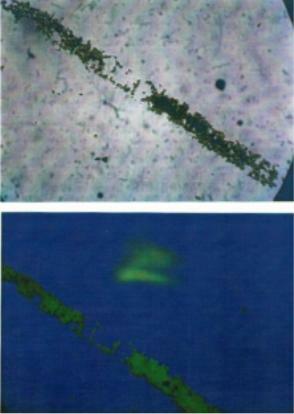 Photomicrographs (@450x) of green substance found on side of fieldworker's car. Substance was somewhat liquid, covering approximately a 3" wide by 4" long section, but did not "run" down side of car. 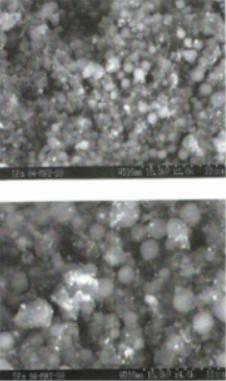 Top: under normal light tiny glassy spheres (1.9- 3.7 microns in diameter are seen through the microscope. SEN (scanning electron microscope) photographs (top @ 2000x, bottom @ 4000x) reveal beads to be both spherical and very uniform in size. SEM photograh (@ 5,000x) of larger ( 10.7 micron diam.) Fe sphere with tiny (approx. 1 micron diam.) glassy micro-sphere attached. Fig. B: EDS of amorphous matrix material (top) and larger sphere (bottom). Scanning electron microscope photogranh (l5,000x) of one of the smaller glassy spheres (1.8 micron diameter) contained within the green substance found on fieldworker's car. 1. The sample contains glassy dielectric micro-spheres, typically ranging in size from 1.5 to 5 microns in diameter, in an amorphous binder. The micro-spheres are primarily Si, with Al, Ca, 0, C (possibly from the SEMstubs), Na, Ti, and a surprisingly high content of Fe. 3. The composition of these objects resembles the composition of many common clay or sand soils. While the constituent elements are constant throughout the sample, we find differing ratios depending on location. There seems to be little differentiation between the micro-spheres and the amorphous matrix in which they are contained, as though both were essentially of the same initial compositionand perhaps one arises out of the other. If the matrix material is crushed or powdered micro-sphere fragments, then this material should fluoresce as well, but it did not. 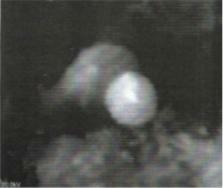 Therefore it may be a more likely scenario that the micro-spheres were formed out of the surrounding amorphous matrix. Both materials seem to be of a dielectric character, as sample charging was very obvious. 4. No match for the glassy spheres was found in any of the readily available commercial-product catalogs of industrial or laboratory glass beads as to size, composition and fluorescence. The smallest diameter of glass beadwe could find for commercial use was in the range of 10-25 microns. 5. Another less populous species of object was found, consisting apparently solid ferrous spheres, in the 10-20 micron diameter range; these spheres seem to be composed exclusively of iron and/or iron oxide. They appear to be conductive, since beam deflection and sample charging was minimal. 6. 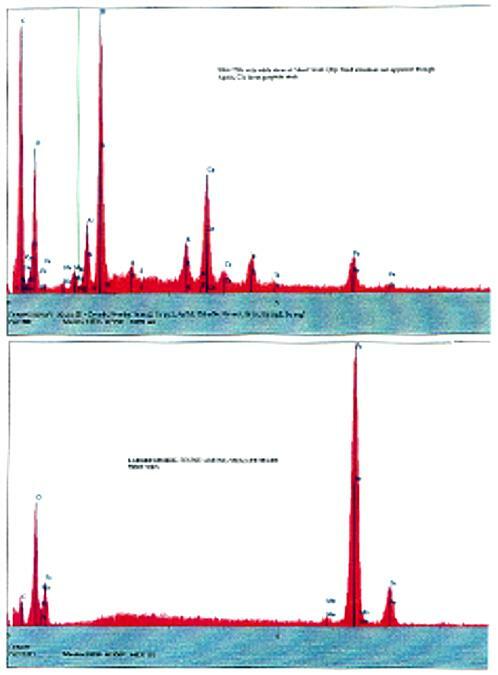 No noticeable radioactivity was observed when the sample was checked with a Geiger counter. 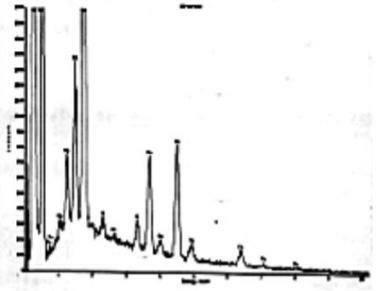 EDS (Energy dispersive spectroscopy) of spheres disclosed high peaks of Al (aluminum), Si (silicon), Mg (magnesium), and Ti (titanium): the carbon peak is most likely contaminant from graphite stub. on his car after sampling the College Ward circle...this should be added to the report, with current date: "Further research into a possible explanation for the green fluorescent material found at College Ward has revealed that the elemental composition is almost precisely identical to Class 'F' fly-ash, a residue produced by coal-fired power plants. The heat produced in these plants turns some of the minerals which are not burned up into the tiny (1 - 5 micron diameter) glassy beads found in the College Ward sample and also produces iron or iron oxide beads in the size range of 10 microns, as also found in this sample. So, both the elemental composition and the size of the beads in this sample are typical of Class 'F' fly-ash residue. However, the color of fly-ash is grey (not green) and it does not fluoresce. Fly-ash is typically trucked back to the mines from which the coal was originally obtained and so we asked Mr. Neilsen to locate both coal mines and coal-fired power plants within a several hundred mile range, to see if the College Ward crop circle site might be on, or near, a truck-route between coal mines and power plants which might be using the coal. His report seems to indicate that this scenario is not very likely and we are now awaiting the final results of his investigation. Nick Reiter, the SEM/EDX technician whose addendum report to W.C. Levengood's initial report appears above, is continuing his search for a reasonable explanation; any results obtained will be sent along as they are available." 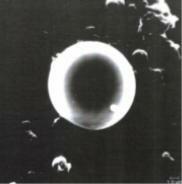 It has been learned that the tiny glassy, fluorescing spheres found by microscopy in the green material associated with the College Ward cropcircle and evaluated by electron dispersive spectroscopy (EDS)are elementally of the same composition as fly-ash--a substance produced as a by-product of coal-fired power plants. The tiny spheres in the College Ward case, however, are MUCH SMALLER Than those found in fly-ash, and THEY FLUORESCE--which fly-ash spheres do not. So, although the elemental composition (determined by EDS) is the same as spheres found in fly-ash (an iindustrial by-product), we still cannot identify the College Ward material due to the size of the glassy spheres and the fact that they fluoresce.